"GNH" redirects here. For the railway station in the United Kingdom, see Greenhithe railway station. For the Canadian hospitals, see Grey Nuns Hospital. 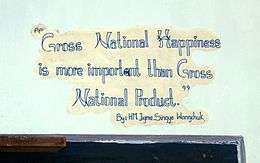 The phrase Gross National Happiness (GNH); (Wylie: gyal-yong ga'a-kyid pal-'dzoms) is a measurement of the collective happiness in a nation. 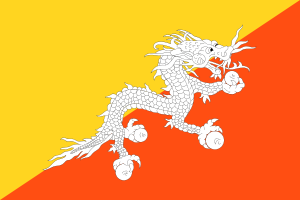 The term was coined in 1972 by Bhutan's fourth Dragon King, Jigme Singye Wangchuck. Originally the phrase represented a commitment to building an economy that would serve Bhutan's culture based on Buddhist spiritual values, instead of western material development gauged by gross domestic product (GDP). Today the phrase is reflected outside Bhutan. Today, GNH has come to mean so many things to so many people but to me it signifies simply - Development with Values. Thus for my nation today GNH is the bridge between the fundamental values of kindness, equality and humanity and the necessary pursuit of economic growth. The GNH concept has inspired a modern political happiness movement. Through the contribution of several western and eastern scholars, economists and politicians, the concept evolved into a socioeconomic development model. In July 2011, the United Nations passed Resolution 65/309, that was adopted unanimously by the General Assembly in July 2011, placing "happiness" on the global development agenda. The GNH concept evolved through the contribution of international scholars and researchers to become a socioeconomic development framework. The GNH policy now serves as a unifying vision for Bhutan's five-year planning process and all the derived planning documents that guide the economic and development plans of the country. Proposed policies in Bhutan must pass a GNH review based on a GNH impact statement that is similar in nature to the Environmental Impact Statement required for development in the U.S. While the Gross National Happiness was an inspirational philosophy, the implementation of a GNH policy was challenging in Bhutan due to the political transformation of the country and the emphasis on the spiritual and cultural aspects of GNH over economic development. Like many psychological and social indicators, GNH is somewhat easier to state than to define with mathematical precision. For more than thirty years, the GNH concept struggled to be accepted by policy makers and economists outside Bhutan due the subjective nature of happiness, the lack of a policy implementation framework and economic measurement system. Although there were few ad-hoc and independent surveys that attempted to measure the happiness or life satisfaction as a subjective score, up to 2005 there was no exact quantitative definition of GNH, but only some studies of individual elements that contribute to GNH are subject to quantitative measurement. For instance, low rates of infant mortality correlate positively with subjective expressions of well-being or happiness within a country. The practice of social science has long been directed toward transforming subjective expression of large numbers of people into meaningful quantitative data. In 1972, Bhutan's King introduced the Gross National Happiness (GNH) philosophy and its four development pillars at an international conference. In 2005, Med Jones, the president of International Institute of Management, proposed a second generation GNH (GNH 2.0) also known as Gross National Well-being or GNW, the first GNW / GNH Index and the first Global GNW / GNH Index Survey. The proposal served as a blueprint for the later well-being development frameworks and happiness econometric models. In 2006, the Genuine Progress Indicator was updated from a green measurement system to a broader concept that included quantitative measurement of well-being and happiness. The new measure is motivated by the philosophy of the GNH and the same notion of that subjective measures like well-being are more relevant and important than more objective measures like consumption. It is not measured directly, but only the factors which are believed to lead to it. In 2006, the International Institute of Management published a policy white paper calling for the implementation of GNH philosophy in the US and inviting scholars to build upon the GNW/ GNH Index framework. In 2007, Thailand released Green and Happiness Index (GHI). In 2009 in the United States, the Gallup poll system launched the happiness survey collecting data on a national scale. The Gallup Well-Being Index was modeled after the GNH Index framework of 2005. The Well-Being Index score is an average of six sub-indexes that measures life evaluation, emotional health, work environment, physical health, healthy behaviors, and access to basic necessities. In October 2009, the USA scored 66.1/100. In 2010, the concept was taken seriously, as the Centre for Bhutan Studies developed a sophisticated survey instrument to measure the population's general level of well-being under the leadership of Karma Ura. Two Canadians, Michael and Martha Pennock played a major role in developing the Bhutanese survey, which took a six- to seven-hour interview to complete. They developed a shorter international version of the survey which has been used in their home region of Victoria BC as well as in Brazil. The Pennocks also collaborated with Ura in the production of a policy lens which is used by the Bhutanese GNH Commission for anticipating the impact of policy initiatives upon the levels of GNH in Bhutan. Later the same year, the Center for Bhutan Studies further defined the original four pillars with greater specificity into eight general contributors to happiness—physical, mental and spiritual health; time-balance; social and community vitality; cultural vitality; education; living standards; good governance; and ecological vitality. The Bhutan GNH Index. In 2010, The Oxford Poverty and Human Development Initiative OPHI at the University of Oxford in UK, launched the Multidimensional Poverty Index (MPI) for the United Nations Development Programme, (UNDP). Similar to the GNH Index of 2005, OPHI promotes collection and analysis of data on five dimensions including Quality of work, Empowerment, Physical safety, Ability to go about without shame, Psychological wellbeing. In 2011 UN General Assembly Resolution 65/309, titled "Happiness: towards a holistic approach to development". In 2011, the Organization for Economic Co-operation and Development (OECD) launched "Better Life Index" (BLI). In 2011 The United Nations released the World Happiness Report by Helliwell, John F., Richard Layard, and Jeffrey Sachs. In 2011 Canadian Index of Wellbeing Network (CIW Network) releases The Canadian Index of Wellbeing (CIW). In 2011, the Israeli newspaper Haaretz published an article suggesting that western GDP economics is an incomplete development model and called for the adoption of Bhutan's GNH philosophy and Jones' GNH Index in Israel. In 2012, a report prepared for the US Congressman Hansen Clarke, R, Researchers Ben, Beachy and Juston Zorn, at John F. Kennedy School of Government in Harvard University, recommended that "the Congress should prescribe the broad parameters of new, carefully designed supplemental national indicators; it should launch a bipartisan commission of experts to address unresolved methodological issues, and include alternative indicators." They proposed that the government can use the survey results to see which well-being dimensions are least satisfied and which districts and demographic groups are most deficient, so as to allocate resources accordingly. The report list the Gross National Happiness Index and its seven measurement area as one of the main frameworks to consider. In 2012, Peter T. Coleman, the director of the International Center for Cooperation and Conflict Resolution at Columbia University, suggested that Jones' GNH Index initiative could inform the Global Peace Index Initiative GPI. In 2012, South Korea launched Happiness Index citing the GNH Index framework. In 2012, the Government of Goa, India published a strategy for socioeconomic development citing the GNH Index as a model for measuring happiness. In 2012, the city of Seattle in Washington, launched its own happiness index initiative, emphasizing measures similar to the GNH Index. In 2013, the Social Progress Index SPI was launched by Michael Porter. In 2014, the government of Dubai launched its localized Happiness Index to measure the public's contentment and satisfaction with different government services. Finally, in 2014, The United Kingdom launched its own well-being and happiness statistics. At present, we are stealing the future, selling it in the present, and calling it GDP. Adam Kramer, a psychologist from the University of Oregon, has developed a behavioral model of "Gross National Happiness" based on the use of positive and negative words in social network status updates, resulting in a quantitative GNH metric. In a widely cited study, "A Global Projection of Subjective Well-being: A Challenge to Positive Psychology?" by Adrian G. White of the University of Leicester in 2007, Bhutan ranked eighth out of 178 countries in Subjective Well-Being. In fact, it is the only country in the top 20 "happiest" countries that has a very low GDP. National happiness is also sometimes classified under empirically studied "National Happyism," and psychologists, Drs. Ed Diener and Robert Biswas-Diener, have researched and analyzed what could be described as technological elements and characteristics of happiness for both individuals and societies. "Rethinking Development: Local Pathways to Global Wellbeing," the Second International Conference on Gross National Happiness was held in Antigonish, Nova Scotia 20–24 June 2005, co-hosted by Genuine Progress Index Atlantic (proceedings online); the Coady International Institute; Shambhala; the Centre for Bhutan Studies; the Province of Nova Scotia; the Gorsebrook Research Institute at Saint Mary's University; and the University of New Brunswick. The second regional Conference took place 8–11 November 2006 at Meiji Gakuin University in Yokohama. The conference examined Haida successes to apply non-western economic and social modalities. The 3rd International Conference on Gross National Happiness Towards Global Transformation: World Views Make a Difference offered an opportunity to articulate Asian world views towards transformation in a "message to the world." It took place in Nong Khai and Bangkok, Thailand between 22 and 28 November 2007. Implying the transition from a natural to modernized state, the 3rd International Conference on Gross National Happiness (GNH 3) took place in two locations: the first three days took place in rural north-eastern province of Nong Khai and the last three days in the urban campus of Chulalongkorn University in central Bangkok, Thailand. The organizers planned all activities so that participants were able to explore a large variety of venues, presentation and discussion formats and draw on the great variety and talents of the entire group of 800 participants who registered. Main co-organizers were the Sathirakoses Nagapradipa Foundation (Thailand), Centre for Bhutan Studies, while local NGOs, progressive business group Social Venture Network and the government of Thailand in particular The Ministry of Social Development and Human Security, Thailand, have formed a support network together with research agencies and other government departments like the Thai Health Promotion Foundation. The 4th International Conference on Gross National Happiness was held in Bhutan with a focus on Practice and Measurement. Results of the Bhutanese survey were presented and a number of international contributors discussed different approaches and challenges to the measurement and application of the GNH framework. In 2009, the 5th International Conference was held at Foz do Iguaçu, Brazil, with more than 800 participants. The conference was organised by Future Vision Ecological Institute and Itaipu Bi-national Hydroelectric Facility, in collaboration with the Centre for Bhutan Studies. The growing interest in GNH within Brazil has resulted from the work of Dr. Susan Andrews at the Instituto Visão Futuro which sponsored a series of events in São Paulo and Campinas in October 2008. Speakers included Karma Ura from Bhutan and Michael Pennock from Canada. On 19 July 2011, the United Nations approved a Bhutan-sponsored resolution 65/309, titled "Happiness: Towards a Holistic Approach to Development", which was co-sponsored by 68 countries. It stated that 'happiness is fundamental human goal and universal aspiration; that GDP by its nature does not reflect the goal; that unsustainable patterns of production and consumption impede sustainable development; and that a more inclusive, equitable and balanced approach is needed to promote sustainability, eradicate poverty, and enhance wellbeing and profound happiness." The resolution was followed by a meeting at the UN in April 2012 which was attended by more than 800 participants including the President of Costa Rica, the United Nations general secretary, the president of the UN General Assembly and Economic and Social Council, government ministers and ambassadors, leading economists and scholars and prominent civil society, business and spiritual leaders. As a result of this meeting a Secreatariat was established in Bhutan, supported by an International Expert Working Group led by Drs. Robert Costanza and Jacqueline McGlade, which will draft a new global development paradigm for presentation to the UN in 2013. Domestic critics argue that emphasis on Bhutan's experiment with GNH has diverted global attention away from government suppression of the nation's largest minority the Hindu Lhotshampa, who formerly comprised approximately one sixth of Bhutan's population. From an economic perspective, critics state that because GNH depends on a series of subjective judgments about well-being, governments may be able to define GNH in a way that suits their interests. Economics professor Deirdre McCloskey criticizes such measurements as unscientific, saying that "Recording the percentage of people who say they are happy will tell you... [just] how people use words," making the analogy that society could not "base physics on asking people whether today was 'hot, nice, or cold'". McCloskey also criticizes the anti-consumerism of the movement to base government policy on happiness, asserting that "High culture has in fact always flourished in eras of lively commerce, from fifth-century Greece through Song dynasty and Renaissance Italy down to the Dutch Golden Age." Other critics say that international comparison of well-being will be difficult on this model; proponents maintain that each country can define its own measure of GNH as it chooses, and that comparisons over time between nations will have validity. GDP provides a convenient, international scale. Research demonstrates that markers of social and individual well-being are remarkably transcultural: people generally report greater subjective life satisfaction if they have strong and frequent social ties, live in healthy ecosystems, experience good governance, etc. Nevertheless, it remains true that reliance on national measures of GNH would render international comparisons of relative well-being more problematic, since there is not and is not likely ever to be a common scale as "portable" as GDP has been. Nevertheless, Bhutan's stated goal is to maximize whatever they see as GNH, not compare numbers with other countries. Alternative indicators of emotion as an analog to economic progress have also been supported by a number of NGOs such as the UK's New Economics Foundation, and are employed in some governments notably in Europe and Canada. The Gallup poll system also collects data on wellbeing on a national and international scale. GNH has only been officially used in Bhutan, where a Gross National Happiness Commission is charged with reviewing policy decisions and allocation of resources. In 2013, with a new administration, the country shifted the focus from spreading GNH globally to the well-being of people within Bhutan. This shift has been interpreted by some as an abandonment of GNH in favor of more standard development initiatives. 1 2 "Policy Innovations - Redefining Progress". policyinnovations.org. Retrieved 18 July 2015. ↑ "The U.N. Happiness Project". International Herald Tribune. 29 March 2012 – via The New York Times. ↑ McDonald, Ross (2005). Rethinking Development. Local Pathways to Global Wellbeing (PDF). St. Francis Xavier University, Antigonish, Nova Scotia, Canada. p. 3. ↑ "Happiness Institute - Happiness Movement Leaders - Who is Who in Happiness Research". gnh.institute. Retrieved 18 July 2015. ↑ "Beyond GDP Paper | Page 2 | John Talberth, Center for Sustainable Economy 2012 at The European Commission Website"
↑ "Gross National Happiness (GNH) - A New Socioeconomic Development Policy Framework - A Policy White Paper - The American Pursuit of Unhappiness - Med Jones, IIM". Iim-edu.org. 10 January 2005. Retrieved 7 November 2012. ↑ [Green and Happiness Index (GHI"
↑ "GrossNationalHappiness". upenn.edu. Retrieved 18 July 2015. ↑ "Gross National Happiness". The Centre for Bhutan Studies. Retrieved 24 March 2011. ↑ Pennock, M; Ura, K. "Gross national happiness as a framework for health impact assessment". Environmental Impact Assessment Review. 31: 61–65. doi:10.1016/j.eiar.2010.04.003. ↑ "A wealth of data". The Economist. ↑ "OECD Better Life Index". oecdbetterlifeindex.org. Retrieved 18 July 2015. ↑ "Home - Canadian Index of Wellbeing". Canadian Index of Wellbeing. Retrieved 18 July 2015. ↑ "בהוטן - ממלכת האושר - סוף שבוע - הארץ". הארץ. Retrieved 18 July 2015. ↑ "National Indicators for a New Era, Ben, Beachy and Juston Zorn, of the John F Kennedy School of Government at Harvard University"
↑ "The Missing Piece in Sustainable Peace". Psychology Today. Retrieved 18 July 2015. ↑ "한국의 경제행복지수 측정에 관한 연구". kci.go.kr. Retrieved 18 July 2015. ↑ "Goa 2035 Vision, page 111"
↑ Melanie Swan. "Dubai brings in Happiness Index". thenational.ae. Retrieved 18 July 2015. ↑ "Measures of National Well-being". statistics.gov.uk. Retrieved 18 July 2015. ↑ Templeton, Sarah-Kate (5 December 2004). "Happiness is the new economics". London: Timesonline. Retrieved 8 January 2007. ↑ http://doi.acm.org/10.1145/1753326.1753369 An Unobtrusive Behavioral Model of "Gross National Happiness"
1 2 http://www.le.ac.uk/users/aw57/world/sample.html A Global Projection of Subjective Well-being: A Challenge to Positive Psychology? ↑ "A Wellbeing Report Card for President Sarkozy". Gallup.com. Retrieved 7 November 2012. ↑ Sonam. "Gross National Happiness Commission - The Planning Commission of Bhutan, Development for Happiness". Retrieved 23 October 2014. ↑ "Bhutan's New Prime Minister Says Happiness Isn't Everything". NPR.org. 3 August 2013. Retrieved 23 October 2014. ↑ "Index of Happiness? Bhutan's New Leader Prefers More Concrete Goals". The New York Times. 5 October 2013. Niestroy, Ingeborg; García Schmidt, Armando; Esche, Andreas (2013). "Bhutan: Paradigms Matter", in: Bertelsmann Stiftung (ed. ): Winning Strategies for a Sustainable Future. Reinhard Mohn Prize 2013. (PDF). Verlag Bertelsmann Stiftung, Gütersloh. pp. 55–80. ISBN 978-3-86793-491-6. Gross National Happiness USA - GNHUSA A nonprofit in the United States focused on Making Happiness Our New Bottom Line. GNH 2 Media Clips tracks the appearance of the notion of "Gross National Happiness" in the media 2000–2005.